For weeks all I could think about was getting to Washington DC for the women's march. It's the historical event of my time. I've watched all that I believe in, from equal rights to healing our planet, crash to the rocks. Getting to DC would be costly, and being on disability from a long haul with breast cancer and complications, wiped out my income. I was discouraged and felt helpless. I kept signing petitions and posted about the good fight. A friend of mine came into town and was staying with me. I told her that we have to at least march in the little town of Santa Barbara not expecting much in the way of an electric energy charge. Many residents filled up the buses and vans to LA, and when I looked into a seat for myself, I discovered there was no room. While driving on the freeway to make our way downtown Santa Barbara, I commented that I didn't understand what all the traffic was about. As it turns out, they were all heading to De La Guerra Square for the rally and march. So full of passionate protesters, we could not push our way into the square for the rally. Over six thousand people showed up to march. I began to feel an excitement and camaraderie I hadn't felt in a long time. Two women in their thirties were standing behind us with their kids and signs. I asked one of the women to take a photo of my girlfriends and me to commemorate the moment. She said, "Sure, and here's a sign you can hold." The sign said "Resilience" in bold bubbled white letters. She told me to keep the sign because her young son would be happy to not have to carry it. I smiled, and gratefully accepted the sign. Little did this lovely woman know just how meaningful and symbolic the sign was. 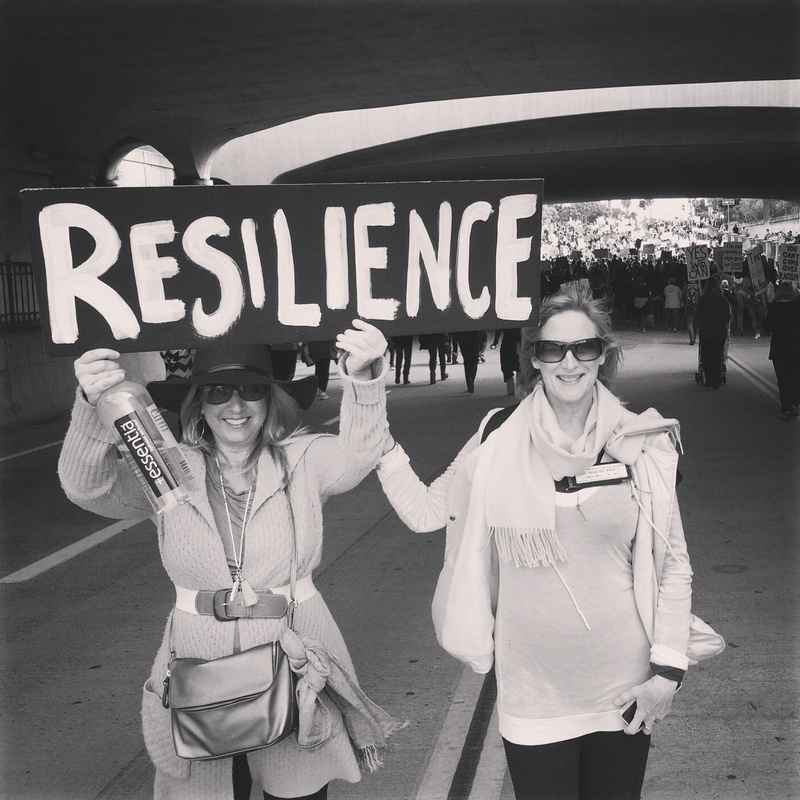 Resilience will be important for all women, and anyone who believes in equal rights for the long road ahead. But it's resilience that kept me alive, and other women like me, who've fought an ordeal with breast cancer. I commend all of us who are resilient daily and gracefully jump over those hurdles thrown in front of us. Somehow, I'm fiercely resilient which truly is a blessing. My mother didn't make it through breast cancer in a time when little was known. I have no doubt that she wanted to fight. I have no doubt that it wasn't an accident when a stranger connected to me, in a critical moment of unity, by passing her sign to a survivor. I won't forget her. And I stand with everyone, living on this precious spinning globe of ours, in need of their own resilience to survive and thrive.